I was afraid of mannequins when I was little and they still kind of give me the creeps. Very stylish. I really like the plastic hair on these two. DBA.............you are one excellent artist.........love the hair and expressions! "...yeah goan jerk me a plank from my yards back fence, gonna whip my little baby, gonna teach her some sense, say now you doan now lawda you doan know my mind. Yeah, you see me laughing lord I'm laughin just to keep from cryin. Whatchoo need wid a ford juss so it wown run, whachoo wawnt wid a woman call her she wown come?" Yeah I cutchyo throat drink yo blood like wine, lawd I aint afraid a livin yeah I aint afraid a dyin..."
#14 bonus track From the R.L. Burnside CD. This pianting is way good. Reminded me of this song. Thanks DBA! DBA.. I believe this is the top number 1 drawing you have in your gallery. When in New Zealand, they had some of the the most outrageous mannequins, I have ever seen. I should scan some for you. Oh, would I love to have a painting of this....Extremely cool!!! love it. That's so realistic it's creepy looking. The one visible eye really makes it. When I was a kid there was this store (originally a factory outlet) called Playtogs and they always had these really creepy looking mannequins that were all damaged and had scrapes all over them like they had been dragged across a cement floor. They probably had been. I thought they were totally freaky. Especially the few that had eyes painted on. Even the male heads had too much eye shadow. Wow, Dead.. you are getting better and better. This is just fantastic. 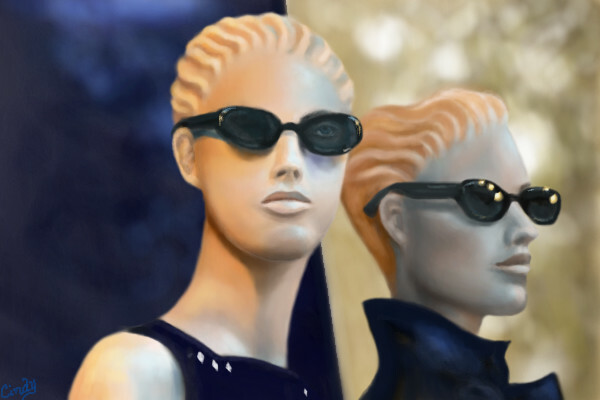 I love the hair especially and the light reflections on their sunglasses. This is excellent. You have a good eye for detail, DBA. One thing that amuses me about this is that it's a realistic representation of mannequins, which are stylized and idealized representations of people. Just wanted to say congratulations on making it into the showcase DBA .Really deserves its spot here :). This is really great work Mizz Cindy . Mannequins kinda creep me out too, did you ever see that Twilight Zone episode where the mannequins take turns coming to life for a day? I dunno how you could stand still for so long like that but I guess it was worth it to freak out a little kid pickin on his sister lol. He's probably still in therapy for that one. Great picture by the way. You did a wonderful job on this. The glasses and the tint to cover the eyes abit is just excelent. Ohh, I almost knowed one down one time when I was messing with it. Nice. Cool,real ,& creepy at the same time.